Agenda is an intriguing approach to note taking on the Mac that’s organized around dates and your calendar. The app is beautifully-designed and notably feature-rich for a 1.0 but lacks an iOS counterpart, which is still in the works, and collaboration features, which will limit its appeal to some users. There are also areas of the app that lack polish, but overall, Agenda shows a lot of promise and should be attractive to anyone who juggles multiple calendar events and deadlines. Agenda organizes notes by projects, which are part of categories. Notes for a particular project are displayed in the center of Agenda’s window, flanked by panels for navigating your notes. At the top of the window, there is what Agenda calls the ‘jump menu,’ which provides much of the same functionality as the left-hand panel, but is handy for navigating notes when that panel is hidden. By placing navigational panels on both sides, your notes dominate the center column of Agenda’s window. The layout provides symmetry and balance that places the focus more squarely on the notes than on navigation, which I like a lot. Both panels can also be hidden from sight, but I don’t find either particularly distracting because they can be resized to fit into thin but functional strips. Notes are created by clicking on the plus button at the top of Agenda’s window or typing Cmd+N. By default, new notes appear at the top of the window in reverse chronological order, but the order can be flipped around by clicking on the name of the project or note in the jump menu. A selected note has a light yellow background, but otherwise, where one note begins and another ends is defined primarily by their titles. The screenshot below includes three notes: Topics, Issue 112, and Test Note. The Test Note at the bottom is selected, which you can also see from the jump menu at the top of the window that shows the note is in the Weekly project under the MacStories category. Notes created in Agenda look nice and handle URLs elegantly, linking the title of webpages to their URLs when the favicon for the page is dragged into the app. Bulleted and numbered lists are supported as are checklists, heading levels, fixed-width type, indentation, and other basic formatting. You can also add stars to individual paragraphs of notes as a way of highlighting something that’s important. It’s a solid start, but I would also like to see support for block quotes, additional fonts, an option for increasing and decreasing text size, and a dark theme. One of the things that I find so interesting about Agenda is that even though many of its features will be familiar to users, it still has a distinctive feel. The difference that sets Agenda apart is its perspective on note taking, which is firmly grounded in the calendar. That doesn’t mean it takes over and clutters your calendar – far from it. Agenda is organized around dates regardless of whether you incorporate notes into your calendar. Searching for notes by date. Notes can be assigned any date in the past, present, or future. For example, you could create a packing list for a trip a month from now and assign it the date you expect to begin preparing to leave home. You could also jot down notes about a meeting you attended a week ago and give the note that date. You could even start a new note every morning, assigning it the current date, and treat Agenda like a journal. The advantage of assigning dates is that you can then search for notes based on dates and date ranges. Clicking on the search button at the top of Agenda’s window opens a search field with a calendar button next to it. From the calendar button, you can search for notes based on pre-defined date ranges or custom ones you choose by dragging across the dates in the pop-up calendar. A link to an Agenda note. You can also link notes to existing events or new events in your calendar. Your calendars with all their events are displayed at the top of Agenda’s right-hand panel. If you pay for Agenda’s premium features, you can also create new calendar events from within Agenda. Clicking on an event gives you the option to create a new note that will be linked to the event. If you’ve already got a note you want to link to an event, there’s also a calendar button that appears in the top right-hand corner of every note when you hover over it that you can use instead. Agenda employs a custom URL scheme to link a note in an event’s notes field. Click on it and you’re taken right back to the linked note in Agenda. It’s a handy feature that makes it easy to link a note to a calendar event. If you want to link to a note in another app, you can do so from the Copy As item under the Edit menu or from the gear icon in an individual note. Agenda has a relatively flat organizational hierarchy, relying on a combination of search, filters, tags, and links to surface notes. To test Agenda, I created a category called ‘MacStories’ with projects for ‘AppStories,’ ‘Sponsors,’ ‘Weekly,’ and ‘Writing.’ That’s just enough structure for most of what I do, but if you prefer a more granular hierarchy, you might want to look elsewhere. New notes are added to ‘On the Agenda’ by default but the behavior can be turned off in preferences. Notes can also be marked as ‘On the Agenda’ manually by ticking a radio button in the top left-hand corner of each note. The feature is pitched as a way to create a working set of active notes, which are easily accessed from the Overview section of the left-hand panel. I think I prefer relying on things like note pinning and sorting by modification date to surface current and important notes because maintaining a meaningful set of ‘On the Agenda’ notes requires me to manage each note’s state more than I like. Notes can also be assigned to people using ‘@‘ tags or any arbitrary category with hashtags. When you want to filter a search by person or hashtag, type the name of the tag in the search field and choose the ‘Search for Tags’ or ‘Search for People’ options from the dropdown menu. Unfortunately, there is no way that I have discovered to create queries that combine tags and keywords. In addition, there is no directory of people you’ve assigned to notes or hashtags you’ve created, and existing tag names do not autocomplete when you’re adding one to a note. A note tagged with #ideas. It’s worth noting too, that by default, searches performed from the search field at the top of Agenda’s window only query the notes in the project that is currently displayed. However, the drop-down menu that appears as you type a query provides an option to ‘Search in All Projects.’ If you’ve paid for Agenda’s premium features, you can also save searches in the Overview section of the left-hand pane. For example, I’ve tagged notes with things I want to discuss with Federico using his name and have a saved search that allows me to pull those notes up quickly the next time we talk. Notes can also be linked to each other, which allows for the creation of wiki-like integrated sets of notes. Links to other notes look just like links to webpages. They use the title of the note you’re linking to and the linked note will appear in the Related Notes section of the right-hand panel. The variety of ways to search and filter notes in Agenda is essential because the lack of note previews makes browsing a large collection of notes more difficult than in other apps. Browsing can be made a little easier by collapsing notes, which reduces scrolling, but its utility is hampered by the fact that a collapsed note only shows its title. I’d like to see an option added for displaying at least the first few lines of a note too. The many ways to navigate Agenda provide the flexibility that many other note taking apps don’t have, but it comes at a cost because it introduces complexity. That creates a learning curve that is steeper than most note taking apps. It’s not an insurmountable issue by any stretch, but getting the most out of Agenda requires users to look at their notes from a new perspective and invest a little time. 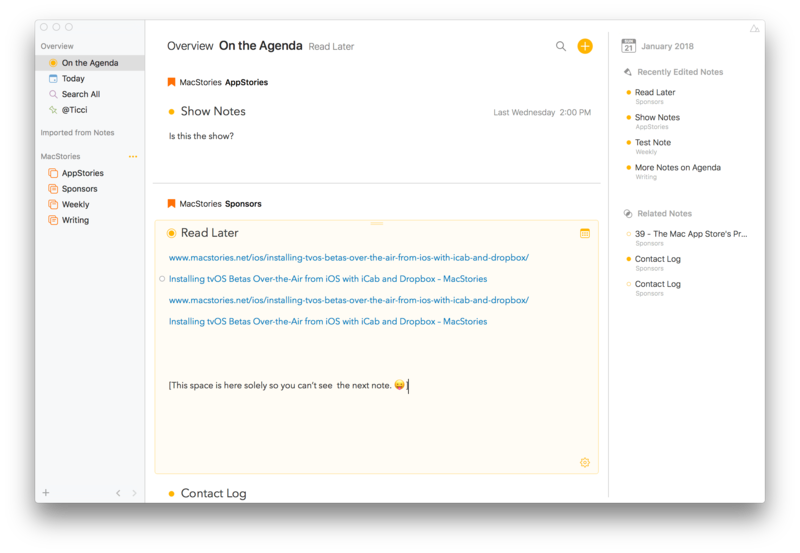 Agenda can import Agenda and Markdown files as well as Apple Notes. The first two types of imports worked well, but importing from the Apple Notes app comes with serious caveats. I imported 755 notes from Apple’s Notes app, which took about two minutes to complete. All of my notes were successfully imported with each folder transformed into an Agenda project, but the imported notes were text-only. None of the images or links with the Notes-style previews were imported. Because so many of the notes I have in Apple Notes include those things, the imported notes were of little use to me, so I deleted them almost immediately. Though not strictly an import issue, pasting Markdown text containing three consecutive dashes into a note crashes Agenda. Notes can be exported as PDF, rich text, Markdown, or Agenda files. Curiously, in my tests, only whole projects of multiple notes can be exported as a PDF file, while individual notes or projects can be exported as Markdown files or rich text. I also ran into a couple of issues exporting notes. First, notes I printed or exported as rich text or PDFs included a message at the bottom that said they were created with Agenda even though I was testing Agenda’s premium features, which are supposed to remove those messages from printed notes and PDF exports. It turns out the message can be turned off from the detailed print dialog that appears when you print a note, which is easy to miss – I did. Second, Markdown exports sometimes dropped the last line of a note unless I clicked on another note and back again before exporting. 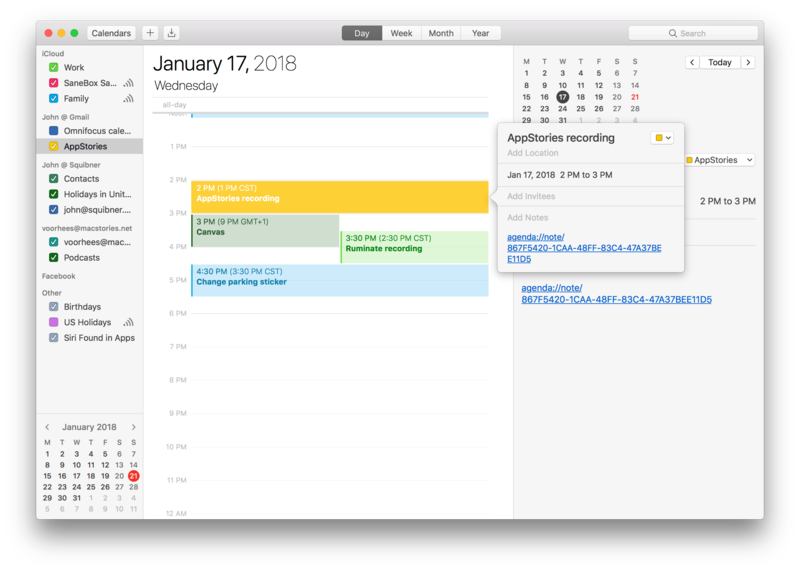 Agenda is Mac-only for now, but the developer says that an iOS version will be launched in the first half of 2018. That won’t be a deal-breaker for everyone, but it does preclude me from making it my full-time note-taking app. After I began testing Agenda, I took some notes about last week’s issue of MacStories Weekly. Almost immediately, I found myself in Slack on my iPad with Federico and Ryan wanting to refer back to a note but couldn’t. Agenda doesn’t include collaboration features either. Although you can export a note and send it to someone, Apple’s Notes app and third-party options like Google Docs and Quip remain better solutions for collaboration. Agenda’s pricing model is worth mentioning too because it is somewhat unique. Agenda’s core features are free. An In-App-Purchase unlocks premium features including the creation of calendar events, saved searches, and copying and exporting of Markdown. The In-App Purchase also comes with any new features introduced for the twelve months following the purchase. If you don’t pay again at the end of twelve months, the app remains functional, you’ll get bug fixes, and any unlocked features will still work, but you won’t get new features that are introduced. Agenda is a polished 1.0 from a design standpoint, but it still has some rough edges, and there are gaps in its feature set as noted above. It’s not an app I could make my default for note taking yet, primarily due to its lack of an iOS version. Besides, I use notes in conjunction with my task manager far more often than my calendar, so the value of its calendar-focused perspective is somewhat lost on me. Still, if you work primarily on a Mac and juggle a large number of calendar events, Agenda is worth a look, especially since the core features are free, which should give most people a fair sense of whether it fits with the way they work. Agenda is available on the Mac App Store and directly from Momenta’s website.